Bronx, NY –– Nov. 13, 2013 – On Friday, Nov. 15, Deputy Bronx Borough President Aurelia Greene will join officials from the Wildlife Conservation Society’s Bronx Zoo and children from PS 205 at Zoo Center to kick-off Bronx Borough President Ruben Diaz, Jr.’s holiday toy drive to benefit Bronx military families. In honor of the start of the holiday season, school children from PS 205 will be on hand to donate the first toys of the year. The partnership between the Bronx Zoo and the Borough President on the toy drive has become an annual tradition. The Bronx Zoo will serve as a collection point for new, unwrapped toys donated by members of the community. Toys will be collected through the end of December and will be distributed by the Borough President’s office to local veterans and active-duty members of the military and their families. In appreciation for their generosity, those who make a qualifying donation of a new, unwrapped toy at any of WCS’s wildlife parks between Saturday, Nov. 16 and Tuesday, Dec. 31 will receive a free ticket to the Bronx Zoo or New York Aquarium depending on location. Toys will also be collected at the other WCS wildlife parks. Toys collected at Central Park Zoo and Queens Zoo will be donated to families in need within the communities they serve. Prospect Park Zoo and the New York Aquarium will collect toys to benefit victims of Hurricane Sandy. 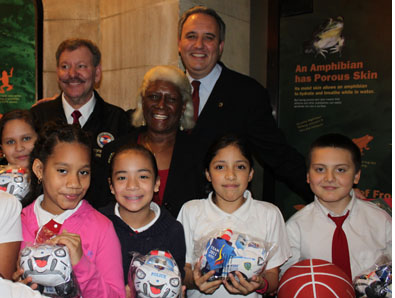 Toys donated at the Prospect Park Zoo and New York Aquarium will receive a ticket to the New York Aquarium. Visit http://www.wcs.org/toydrive/.